The above graphic is created by @woodard_julie and I found it just now on Twitter from KQED. By following these ideas, teachers are better educators and more importantly, students become better thinkers. We so often miss opportunities to let the kids think. Teachers, please stop telling the students in front of you what to do! Let them find the answers. It does take some different planning. Many of you are probably already doing the left side of Julie Woodard’s graphic. You see, if we give them time with a clear learning target that we expressly share with the students at the beginning of class, students have an idea of what they are going to learn. But again, teachers: Stop and let the kids think. It is not good enough to have teacher-talk objectives on the board and never refer or explain them. Go through the learning target; it’s not just there for show. As an observer and department chair, I do want to see it, and I especially want to know that every student really understands that target. When we help make connections to the outside world and between content areas, then students can begin to see why they need to be in classes that they may not like. And in some cases, they may detest the class. Let’s be honest, this is true for some. So, let’s help these young men and women, girls and boys see how their learning is worthwhile. Then give them time to think and talk with more people than just who is sitting next to them about how the learning possibly could be worthy. And as John Hattie has explained, clear expectations of where the end is going helps students not be swimming in a rough current without paddles. Who wants to feel lost and drowning? Don’t we all — at any age — want to know when I have met the expectation? We owe our students more than just endless content; they deserve the respect to give them time to process ideas and have a map with those ideas. So, rather than planning more, plan to stop talking. Plan to let the kids have time to think in their own mind– with paper so that they can jot down notes and contemplate Woodard’s questions. Then time to play with the ideas with a partner, and then with you or the class. Students really don’t learn from our babble. Remember, Charlie Brown’s teacher? “BLAH, BLAH, BLAH, BLAH.” The kids of any grade may not have learned all of our content yet but they have strong brains which we need to give time to eat up the information. Next time, we’ll talk about how to change the classroom so they are used to this new style of time and thinking. For now, it is up to YOU. Teachers, please stop telling the students in front of you what to do! Let them find the answers. There are two parts to this topic of teacher-directed vs. student-engaged, and we are only dealing with the planning part here. The conferencing part is for another blog. The graphic above is a portion of a slide projected at one of the many dynamic Great School Partnership/New England Secondary School Collaborative conferences I attended over the past 5 years. This puzzle of moving away from the teacher to the student is foreign and terrifying to many educators — whether they are elementary, secondary, or post-secondary. I see it daily. I equate this puzzle with the person who has never traveled outside of the country: You need a passport whether you are traveling to the EU, an African country, or a next door neighbor — Mexico and Canada. Seems easy enough to get the passport and all should be good to fly away. But as many travelers know, a passport is only one travel puzzle piece. Another piece is standing in line to clear Homeland Security. The inexperienced traveler puzzles: Why do some people get to go in that shorter line by showing that other card? Why am I not in control? Upon arrival as a visitor, I am coming to spend money and enjoy my time not stand in more lines to clear immigration and then another line for customs! The puzzle continues for the new international traveler. Coming back to the USA, possibly running late for the plane, and once again there are those 2 lines: One is short and quick to use that Global Traveler card — the other is endlessly long, possibly opening luggage, answering questions, and time is running out. Why don’t I have one of those cards; the puzzle pieces aren’t coming together. For those who have not traveled it is a puzzle. It’s not a puzzle: That’s not how students learn. Backward planning is essential. What do the students ultimately need to know? And only after fully answering that essential detailed questions, do we decide how to get our kids there through their engagement. It is NOT about the teacher; it is about the student. 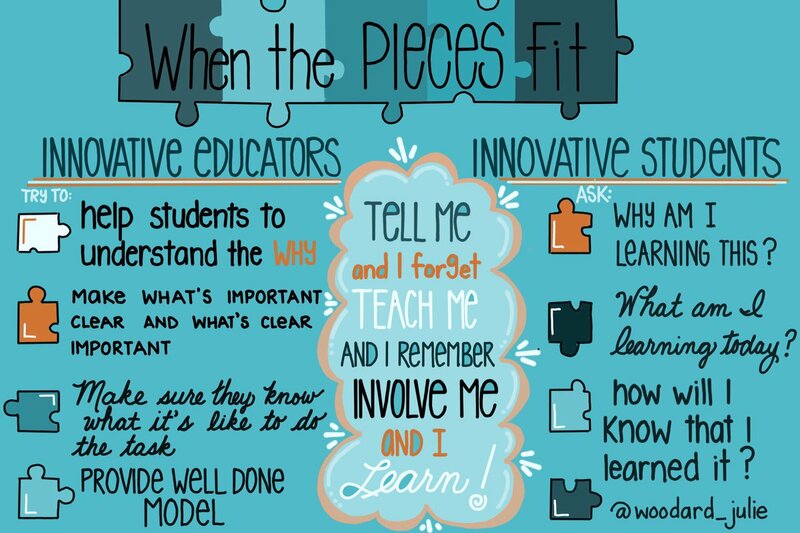 All of the pieces in between are the student-engagement puzzle pieces — not teacher-direction. Yes, there will be the teacher’s mini lessons which lays foundations along the way. Yes, the teacher is constantly involved, but the change in the puzzle of teaching is that the student is at the center — NOT the teacher. With my backwards planning, I have to think through and carefully plan how my students are involved in their learning each day. They are not passive: Those puzzle pieces don’t put themselves together without help. If they are bored and not learning, the pieces won’t fit together. We know from research, that forced pieces break or get bent and are no longer part of the educational puzzle — they drop out. Student engagement doesn’t mean just paying attention; it means they are involved in their learning. One way to do this is through the Jigsaw instructional strategy. According to John Hattie’s 2017 updated work, Jigsaw has an effect size of 1.2. It is within the top 10 most powerful ways students learn. Not surprising that this strategy is when students learn and are engaged with their peers. Ironically, jigsawing puts puzzle pieces together! Are you moving students to the center of your classroom? Are you reflecting how engaged your students are? Did you plan the end first or did you plan what you were going to do? Have you put your student puzzle together? Just a moment ago I saw a TV advertisement encouraging teachers to allow more student talking, and it reminded me of an experience this past spring in my 8th grade class. I don’t remember the company who was being advertised, but that’s not important. My 8th graders were in a Tier 2 class because they read 1-2 grades below grade level. They needed support, and I designed this class a few years ago to help the “whole child” as ASCD (Association for School Curriculum Development) encourages. This is not just a reading class — it is much more and helps the kids become “students and grow as individuals”. Working with each one of them individually, they learn how to help themselves support their learning as a whole — at home and at school. Eventually, the most verbal students agreed on three questions everyone should answer. Although 5 out of the 3 students tried to get buy-in, the others were pretty much non-committal. I recognized that I had taught them well — that all members counted in our class — not just a few. Another gratifying moment! Now that the questions were established on the easel for all to see, I asked the students to re-read the article with the questions in mind. After checking that all had finished their re-read, I encouraged them to go ahead. Again, those 16 eyes stared at me. “Take a chance. Think back to what I said. You created the questions. Go for it.” They could see I was not taking notes because that would have created undue pressure. “Ok…ay…,” Edgar said. (My student’s names have been changed for obvious privacy issues.) “Who is going to start?” There was no response. “Let’s go with questions number 2,” Edgar continued and read the question. Dan answered with an amazingly deep response that I had not heard from him in months! Although he was not pointing to the text, his paraphrasing was excellent. Soon Jane joined — she is usually off task and reading some other page on her computer rather that the assignment. But not today! She was referencing the article with specific pages and paragraphs. Can you imagine the pounding of my heart? The puzzle was coming together! This was a SOCRATIC SEMINAR BECAUSE BECAUSE I WAS NOT INVOLVED. Hence, the misunderstood puzzle of student discourse. Eventually 5 out of the 8 students discussed a 3 page SCOPE article for more than 30 minutes and wanted to stay after class to continue. Rarely was their repetition and when it occurred, one of the students called their peers back on task. That is a rarity on all counts. The only thing I reminded was that not everyone was participating. And as another proud flash occurred, Edgar, my self-appointed student leader asked each student what they thought. Obviously he was paying attention not only to the questions as they went through them but also to the participants. The puzzle of Socratic vs Shared Inquiry is when the teacher is involved, it is Shared Inquiry. Socratic is student-led not teacher-driven nor teacher-participating. It doesn’t have to be a puzzle: Just a puzzle of terminology. And then: GIVE THE KIDS A CHANCE — THEY CAN PUT THE PIECES TOGETHER. Pardon me while I use an often frowned upon transition: Using a question to begin a response. Have you ever felt like your world was overwhelming and weighed much more than your job? Yes, me too! I remember when I worked in the business world I would become annoyed as co-workers spouted on and on about their personal lives as if nothing else mattered. I do tend to be the self-described task-master. There was work to be done, but there were employees who were beaten down with their home-life demands, not enough work to be a distraction, or those who were more consumed with themselves than their job. Don’t get me wrong — I can fall into the first two categories. My parents, sister, and brother-in-law never allowed the latter to occur: Work ethic was an ownership I was expected to have, and it began at age 11 1/2. But, I digress. As educators, we need to remember that our paramount focus everyday is not our personal lives! It is our students. People look at me like I am crazy when I say I have almost 600 students. And as a high school department chair I do have almost 600 students. In our discussions, my department chair colleagues agree with me that we take on that responsibility in our jobs. I have to forget myself and focus on these kids. Each of them is a puzzle. The summer before I became department chair, I met a social studies teacher in our high school. He gave me the best puzzle piece possible: As you walk down the hall, greet every student whether you know them or not. The teacher — who at our loss moved to another district — told the story of a student whom he had not taught but spoke to daily. The boy came to Mr. W. as a senior and said Mr. W. had saved the kid. This teacher had made it worth coming to school every day because the young man looked forward even in rough times of being acknowledged by Mr. W.
Talk about the power of a teachers words! Leave our personal world at the door or at best tell our students of the personal sticky-point (if appropriate) and then move on. How do I help a student, and when do I leave them alone? Greet them — absolutely! Get to know the students in my classes — without a doubt! Which puzzle piece do I choose that day for each student? These are the questions we must ask — and more importantly not forget to ask ourselves. As I sat 2 seats away from the graduation entrance ramp 2 weeks ago and my former students walked up, it was difficult not to cry. I witnessed my former 7th graders emerge from pre-teens through high school and now leaving us. It was my lucky seat as they looked at me and gave a wave, I congratulated, their sincere smiles, my robust applause, and their elation. Each day as their 7th grade teacher and as I followed their progress through high school, I had the power to send them on with a positive motivation or a negative impact through my words. Every day is a puzzle for each of us as we speak with our students. How we deal with that puzzle is crucial. What’s on Your Summer Shelfie? I’m going for a variety of genres and time periods this summer! People are amazed that with 21 of 30 required credits toward my doctorate — yes, I stopped working toward the degree because the university was unrealistic with the real world — that I wasn’t able to comprehend until I was 16 years old. It is a sad reality. Weaver reminded me of the somewhat convoluted but real situation: I had really learned grammar once I learned Spanish. I know that seems like a piece from another puzzle, but it isn’t! Still today, I work to convince educators that students can sometimes better learn English through a world language. It is an amazing puzzle. And sometimes it isn’t true because EVERY ONE LEARNS DIFFERENTLY. We are all pieces in one big puzzle. If you have not read her book, Teaching Grammar in Context, by Heinemann, 1996, it is timeless and relevant — regardless that it is almost 20 years old. Weaver emphasizes that if students can understand the basics of grammar and punctuation, then they can write. And therefore they improve their reading comprehension. I know this is true for myself and from my work with students. Aren’t these what GE, Microsoft, Berkshire Hathaway, Apple, Ford Motor, and other big companies want their employees to know how to use in their writing to represent them well? Grammar doesn’t have to be a puzzle. Recently, one of my students, let’s call him Jim, kept telling me that he didn’t know how to write a conclusion. By the way, his name has been changed. I tried conferencing — which if you have read this blog — you know I strongly believe in this strategy. However, as with all strategies this time it didn’t work. When my students chose their topics of what they needed to focus on, several said paragraphs and elaborating. So we broke down the writing as a whole class. Beginning with a mini lesson and then sketching out the intro, body, and conclusion. However, the only way any student can write is to EDIT and REVISE which means including CONSTANCE WEAVER’S Teaching Grammar in Context. After three practices, Jim told me in a writing conference that he was feeling more confident about his conclusions because of how we had broken down the paragraphs. Yeah! The scaffolding had worked. A different piece made it into the puzzle. Grammar doesn’t have to be complicated. Punctuation doesn’t have to be a mystery. Why do educators go into such detail that no one understands it! How much time is spent in your classroom spent THINKING? When we give students time to THINK, then they can process their ideas. So often, teachers rush to move on. Students can’t always move that fast! Many brains need time whether it is to answer a question, THINK about a text or to THINK about a math equation. I hate that I cannot remember where I found the graphic below because it is great! I believe tells us so much. If you know, please leave a comment so I can give them credit. If we think about ourselves, how frequently do we wish that we had THOUGHT before we spoke? We need to give that same courtesy and teach that ability to our students. This past week, I was reviewing assessment-taking strategies with 6th graders. During two- 35 minute sessions, four students raised their hands before I had even said the main idea of my question. We have indirectly trained our kids to answer right away. And THINK about this puzzling question: We wonder why students don’t put the pieces together in our content! The simple answer is they can’t because they haven’t had time to THINK. We do have to remind our students to pause to use their brains. Like I wrote above — these boys and girls — were eager to participate even though they didn’t know the specifics of what they were going to have to answer. For many years when I was carrying a full-load of 5 classes a day and 120-135 students, there were two signs in big bold letters: Reading is THINKING. Writing is THINKING. The signs weren’t there for show; I used them as a frequent message. Before asking a question, I remind my students not to raise their hands until I ask them to THINK about my question or statement. When hands are up, students already have an idea in their minds; they are not THINKING. When hands are up, they believe they know the answer to the puzzle we are asking. They can’t put the pieces together because they haven’t THOUGHT. I have believed in THINKING for a long time because I was one of those learners who could not answer right away. I was intimidated by questions. And because of my auditory processing, lots of times I hadn’t even heard or had misheard the question being asked. Therefore, how could I answer the question right away? I needed time to THINK! Usually I had to figure out the puzzle of what had been asked and then put the pieces together. I wasn’t a strong student and was told that many times. The longer I took to answer the more impatient my teachers became. The instructors didn’t give me time to THINK which I needed. Don’t be that restless teacher that is eager for an immediate answer so you can move on. In the long run, the information stays with the student when they have the opportunity to THINK. So the next time you are in front of the class, whether you working with a small group, or conferencing one-on-one — give the student time to THINK. It will take practice and retraining those arms and hands that want to pop into the air. But it is worth it. You will be amazed that although you might not see immediate improvement, over time, you will see great results. Getting students to the point where they talk about deeper topics than who did what or where can be a challenge. For less than confident readers, they don’t trust that they do know how to put the puzzle of a text and their thoughts together. Initially, some of my eighth graders were confused — there weren’t any of the familiar words in the question. Where were the words author, text, evidence, character, infer? Lots of blank stares came up to me as students filled in their reading log via Google Forms. I knew this was a new type of question for them, and I also knew they were ready for it. Purposefully I had not given a mini-lesson on how to answer this. I was intentionally using this question as my formative assessment. Individually, I framed the question, “What’s worth talking about here?” from the idea that if he or she was leading a small group discussion, what would be the topic the student would begin with. This was enough for some to go on and answer. And as should be true — since all of our students learn differently — some students needed more explanation so we talked through his/her text using character, setting, and plot. As anticipated, some did not need any explanation which is what I found while conferencing with each student. A few of my middle schoolers had been able to respond to the question on their own without my help. And based on their reading conferences, as always I monitored and then adjusted the puzzle of my lesson and timing for the day. Regardless of how quickly each student caught on, it’s true, this is a great question! Whether it is used as a written reflection about their independent choice novel or during a class discussion about an article that we read together, this deep question gets kids thinking. As a teacher, “What’s worth talking about here?” tells me who understands the fiction or nonfiction they are reading. Sometimes it is the simplest words that give us the most information and the pieces fall together more easily.